Are Afghan Troops Really 'Getting Good Enough' to Take Over for NATO? This month, the Marines in Afghanistan will no longer have access to amidnight dinner service at Camp Leatherneck. This is reportedly due in part to the 2014 drawdown process, whereupon the bulk of U.S. forces are slated to leave Afghanistan. On its face, this isn't such a big deal. 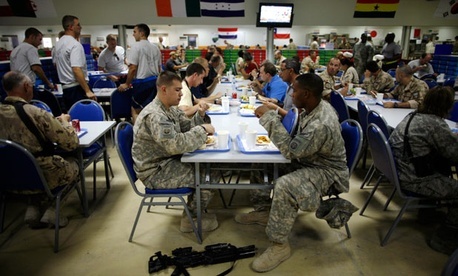 Service members, after all, aren't entitled to Taco-Bell-esque "fourth meals." (They are entitled, in fact, to surprisingly little.) The problem is that midnight meals serve a purpose beyond sustenance. For those Marines who aren't going anywhere for another six months, the loss of this hot meal will hurt morale and readiness. When I was in Afghanistan, a soldier named John was attached to our unit. He was a little old to still be an E-5, which meant he wasn't doing something right with his career, or had made some mistake in the past and suffered a demotion as a result. (A popular joke goes: Q. What's the fastest way to make E-5? A. Make E-6.) He was a cook, which isn't the most glamorous job the Army has to offer, and he smoked incessantly—Marlboro reds at the start of his deployment, eventually graduating to some type of Korean cigarette that burned exactly the way I imagine throat cancer to burn. He was a nice guy, and we talked often, usually next to an ancient, disused fire pit that had been converted to the world's largest ashtray. A few weeks after arriving, John was given charge of our camp's midnight chow, a meal that wasn't previously offered.